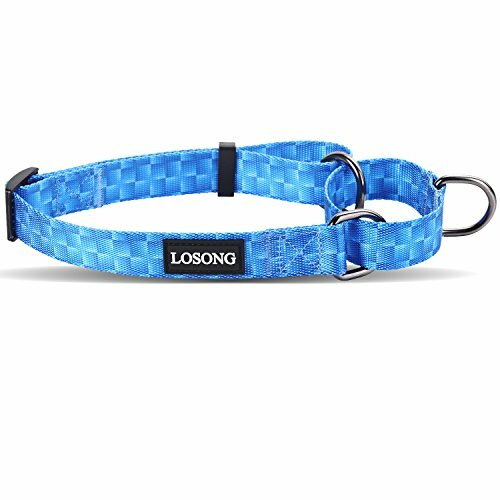 Pattern Name:Gradient Blue Woven | Size:Medium Pattern Name:Gradient Blue Woven | Size:Medium WHAT IS A MARTINGALE COLLAR? The main difference between a martingale collar and a regular collar is that it tightens up as a dog pulls. The purpose of this is to prevent a dog from escape the collar. Because many dogs have heads that are the same size or smaller than its neck. "MANY DOG RESCUES ONLY EXCLUSIVELY USE MARTINGALE COLLARS"
Plastic-free buckle design, which avoids rubbing against your doggy's skin or hair, keeping them comfortable. Our martingale collars are measured fully extended. When measuring your dogs neck, please measure his neck near the top portion and be sure to press down through all its fur to get an accurate measurement. Most people do not press down the fur to get a correct measurement. This leads to them over measuring their dog's neck. And leads to them ordering a size that is too large. When the collar is on your dog, the metal rings at the ends should not touch. The nylon portion attached to the D-ring should be extended. 1. Using thermal transfer technology Fashionable printed durable high-density shiny polyester webbing strap for beauty and style. 3. Available in 4 unique patterns with beautifully crafted print and fun vibrant color. Suitable for all dogs, male or female. Size Small, Neck length 9.8"-13.8", printed polyester webbing layer width 3/4"
Size Medium, Neck length 13.4"-20.9", printed polyester webbing layer width 3/4"
Size Large, Neck length 16"-25.2", printed polyester webbing layer width 1"
Losong provide a wide selection of unique designer fashion products. and specializes in producing high quality,safe and comfortable pet products,we focus on every single detail,devoting ourselves to provide the best service for you and your pet. Purchases are 100% guaranteed! If there are any issues with quality, we will provide after-sale policies entitling your money back or new item exchanged.